That the specifics are entirely missing does not really matter though, because announcing that one is going to “fight” the deficit by making single-digit cuts to ABCs is like announcing that the government will clear over six feet of snow from the streets of Lucan using a window scraper. It can’t be done. To see what I mean, consider the 2009-2010 interim figures set out in Table 31 to the 2010 Provincial Budget. Total expense for those 6 items: $88.3666B. Therefore, after removing those six items from the budget, Total Expense for all other ministries *combined* is: $117.739 B minus $88.3666B = $29.3724B. The deficit in the same period is represented, in the budget, to be: $21.330 B. Therefore, $21.330B / $29.372B * 100 = 72.6% of Ontario’s 23 other ministries included in the budget (i.e., all ministries other than the health, education, and welfare ministries), are paid for with entirely borrowed money. Put another way, to balance the budget without touching health, education, or welfare, the government would have to close down entirely an average of 16.7 Ministries altogether. Put yet another way, 60% of the government’s ministries would have to be closed just to balance the budget. Gone would be such government functions as justice, childrens’ services, finance, revenue, tourism, transportation, aboriginal affairs, citizenship/immigration, energy, environment, etc.. In other words: big announcements that the government is whisking a few millions off of the budget here and there to “fight” the deficit smacks of either self-delusion or misinformation: there’s no “fighting” going on at all. It’s pure symbolism, without any practical effect. It is play acting, intended to make you believe that the Liberals and Conservatives have plans to balance Ontario’s books when, in fact, neither does. That Tim Hudak’s Progressive Conservatives are going along with such Liberal nonsense by similarly suggesting one or two other miniscule cuts speaks volumes about how utterly redundant the PC party has become. Whatever one might argue the Progressive Conservative Party to have been in the past, it is now – as it was under John Tory’s leadership – nothing but a backup party for the Liberals. Yes, the Liberals have to go. 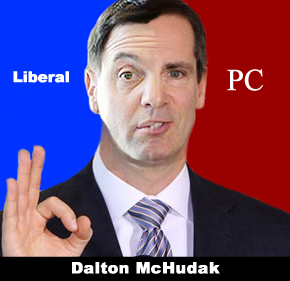 But to fill empty Liberal seats with Tim Hudak’s red tory, crypto-Liberal Progressive Conservatives would make nothing any better, and most probably would make things worse: a bad Liberal plan is better, after all, than the blank-paged PC platform Mr. Hudak wants the voter to vote for. Luckily, it is not the case that the PCs are the only party available to fill the power vacuum when the Liberals are sent packing. But I digress. The bottom line: without increased revenues – and, please note that tax increases are not an option – there is simply no way to balance the Ontario provincial budget unless health care, education, and/or welfare take a major hit, or unless health and/or education cease to be tax funded. We cannot simply keep racking up double digit deficits year after year: we’re only prolonging the pain, and paving the way to even more difficult cuts going forward. We are not merely in the midst of a downturn in the economy. The hundreds of thousands of industrial and other jobs Ontario has lost over the last few years are not coming back so long as high taxes and expensive government programs make it unprofitable to hire Ontarians. We are not competing with the USA. We are competing with India and China. We are in the midst not only of a so-called “global” recession, but also in the midst of a global corporate restructuring. Trust me, as a person whose law practice is comprised almost exclusively of helping people who have lost, or are losing, their jobs, I know. At the same time, Ontario’s relatively large population of baby boomers are becoming senior citizens. They are entering the most expensive season of their lives, in terms of health care. The younger population earns less than the boomers, and is fewer in number, yet it is somehow expected that the younger population will be able to shoulder the cost of ballooning government health care and education expenses. (Note: health care alone already consumes over 65 cents of every Ontario tax dollar). Concerned Ontarians should – as I have – write to their local newspapers and ask that they put McGuinty’s and Hudak’s feeble, miniscule cuts into perspective, as I do above. Anything less only encourages the Liberals, the Progressive Conservatives, and the mainstream media, to continue this ‘deficit-fighting’ farce.